* New beginner/intermediate class starting from Thursday, 3 May 2018. Please call YMCA direct @ 6336 6000 for inquiry and registration. * Ask for Pay-Per-Lesson if you want the flexibility to juggle your schedule. Have your family members and friends ever wondered why you’re so enthusiastic over line dancing? Here is a chance for you to get them to share your passion. Introducing a beginner line dance class to start off the new year of 2016, jointly organized by YMCA and CLDAS. The course consists of 10 weekly lessons starting from Thursday, 14 Jan 2016, 7:00-8:30 pm. The unique feature is the free practice jam for students from 8:30-10:00 pm after each lesson. It is open to all others at a fee. You will have an opportunity to view and dance at the venue with the open house on Thursday, 7 Jan 2016, 7:00-10:00 pm. Click here to download the flyer for more details of the course and the open house. To join the elementary line dance class, kindly download and fill up the YMCA Associate Membership Application Form. Under the heading of “Course Details“, simply indicate “Line Dance” as the name of the course. 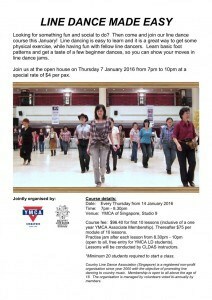 Please email the completed form to us at “linedanceclass@cldas.com” so we can lodge your registration with YMCA. Full payment is due only upon confirmation of class commencement. call us at 9090 6876. See you soon on 7 Jan 2016 @ YMCA.